The two island groups are in the North Atlantic Ocean, southeast of the Bahamas, north of Hispaniola, at 21°45′N 71°35′W﻿ / ﻿21.75°N 71.583°W﻿ / 21.75; -71.583Coordinates: 21°45′N 71°35′W﻿ / ﻿21.75°N 71.583°W﻿ / 21.75; -71.583. The Caicos Islands are separated by the Caicos Passage from the closest Bahamian islands, Mayaguana and Great Inagua. ↑ 1.0 1.1 1.2 "Turks and Caicos Islands". CIA World Factbook. https://www.cia.gov/library/publications/the-world-factbook/geos/tk.html. Retrieved 13 March 2013. ↑ "Demographic Yearbook 2011" (PDF). United Nations Statistics Division. //unstats.un.org/unsd/demographic/products/dyb/dyb2011/Table03.pdf. Retrieved 30 March 2013. ↑ "Turks and Caicos Islands". Encyclopædia Britannica. 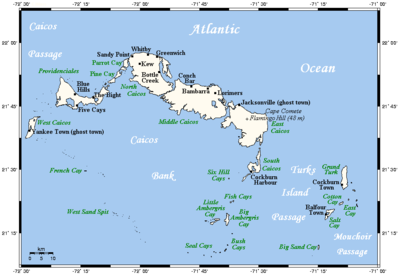 http://www.britannica.com/EBchecked/topic/610193/Turks-and-Caicos-Islands. Retrieved 13 March 2013. ↑ "TCI Physical characteristics". http://www.depstc.org/stat/economic/ecopdf/envt/TCI%20Physical%20Characteristics.pdf. Retrieved 13 Mar 2013. ↑ "STS-100 Shuttle Mission Imagery". Spaceflight.nasa.gov. 1 May 2001. http://spaceflight.nasa.gov/gallery/images/shuttle/sts-100/html/sts100-708-078.html. Retrieved 01 April 2013. ↑ "Languages of Turks and Caicos Islands". Ethnologue. http://www.ethnologue.com/show_language.asp?code=tch. Retrieved 30 Mar 2013. ↑ 8.0 8.1 "Turks and Caicos Creole English". Ethnologue. http://www.ethnologue.com/show_country.asp?name=TC. Retrieved 30 Mar 2013.